A Senator, a Delegate, and a Councilwoman; Senator Idamae Garrott was the definition of a true community leader and the personification of a thoughtful legislator. Born in Washington D.C. on Christmas Eve in 1916, Garrott and her family would ultimately move to Hyattsville. She would attend Hyattsville High School then graduate from Western Maryland College in 1936. Following her college graduation, she would pursue a career in education as a teacher in the Baltimore City School System. She would teach for ten years before her marriage to William N. Garrott in 1948. The two would settle in Aspen Hill and their marriage would welcome two children (W. Riley and Katherine). At the age of 50, Garrott would answer the call to public service and she wouldn’t look back. Elected to the Montgomery County Council in 1966, Garrott quickly proved herself an impactful legislator and a champion for the voiceless. On the local level, she would prove a staunch proponent of strict land-use policies, civil rights and of critical environmental protections. 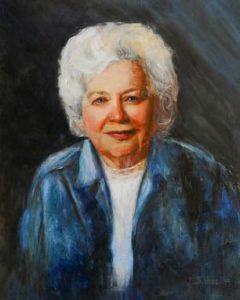 Completely connected to the communities that she represented, Garrott would be known for her close attention to detail and deliberate yet thoughtful manner. She was never afraid to take a stand and was often the lone dissenting vote on many legislative issues before the Montgomery County Council. Garrott would begin a new avenue for service in 1978 upon her election to the Maryland House of Delegates. She would go on to serve in the House from 1979-1987 until her election to the Maryland Senate, when she would take office at the onset of the 1987 legislative session. Garrott’s transition from county service to state service was a seamless one. Similar to her local service, she was known for her thoughtful manner and would become a champion for the issues of children, education, transparency, and the environment. Uniquely able to live the old adage of disagreeing with someone without being disagreeable, Garrotts’ manner would engender respect from countless, disparate individuals. She would mentor numerous Montgomery County public officials including future Senators Sidney Kramer, and Leonard Teitelbaum along with other well-known Montgomery County political leaders including Phil Andrews, William Hussmann, and Neal Potter. Idamae Garrott passed away in 1999 at the age of 92. She passed having truly been an example of the term “citizen-legislator” and having served her community and her state with a dedication and a dignity paralleled by very few.